Such was the case when Mercurio specified Sherwin-Williams Paint Shield® Microbicidal Paint in a repaint at the Fitness and Recreation Center (FitRec), part of an on-campus complex that houses nearly 1,000 BU students. FitRec features two swimming pools, two gyms, locker facilities, and a rock-climbing wall, and has been a popular addition to campus life since opening in 2005. The local Sherwin-Williams team then stepped in to help guide application. “We made a commitment to the University that the coating would perform as promised. And since it is new, we were happy to work with the contractors on the job site,” says John Franta, a Sherwin-Williams Architectural Account Executive servicing the New York-Boston corridor. Ron Pagliuca, Vice President of Wilder Painting (Quincy, Mass. ), says the two-coat system was brushed and rolled by the Wilder team. Wilder is one of several contractors with whom BU is partnering. 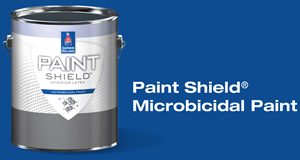 Successfully installed at FitRec, Paint Shield® is now part of the specification package for at least 39 rest rooms in the high-rise dormitories. And Mercurio sees its potential for use on the Medical Campus at BU as well.